Palm Coast currently has approximately 541 miles of public streets and 1,082 miles of drainage swales to be repaired and maintained. This element involves a goal to achieve an annual allotment of 50 miles of what is called "major maintenance" or resurfacing of badly deteriorated streets. 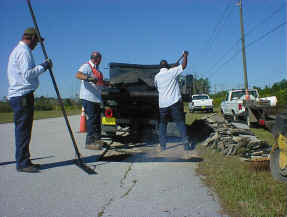 A program is being developed that will smoothly manage the overall street maintenance system in the City of Palm Coast. Please direct any questions you may have about resurfacing to the Stormwater Department. Currently, routing asphalt patching and contractor's pavement damage repair work are done on a weather permitting basis year round. The city has over 1,082 linear miles of drainage swales, which require both routing and major maintenance. 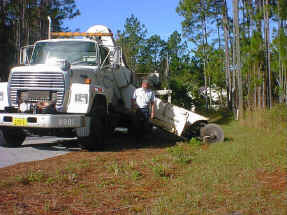 Repairs and maintenance are done on an as needed basis. The swales system is designed to hold storm water and allow it to filter gradually back into ground water. Mowing of undeveloped portions of public right-of ways is what the mowing program has typically been comprised of in recent history. Previously during the high growth season, mowing and trimming of the entire city may have taken up to seven (7) weeks. This year the new Parkway Maintenance Program is being initiated with a fair amount of variation to the former basic mowing routing. As of 10-01-01, jurisdiction for an additional 55 miles of major arterial streets officially were transferred to the City from Flagler County, along with several park facilities, as another point of finalization in the transition involved in the incorporation process. Street sign maintenance involves a current inventory of over 9,000 directional, traffic control, and street name signs requiring repair and maintenance.